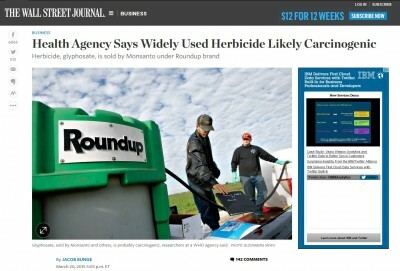 Wall Street Journal online screen shot of their article on glyphosate and cancer. Source. Last week the U.S. mainstream media widely reported on a new study published by the International Agency for Research on Cancer (IARC), which evaluated 5 different insecticides and herbicides. On the basis of tumours in mice, the United States Environmental Protection Agency (US EPA) originally classified glyphosate as possibly carcinogenic to humans (Group C) in 1985. After a re-evaluation of that mouse study, the US EPA changed its classification to evidence of non-carcinogenicity in humans (Group E) in 1991. The US EPA Scientific Advisory Panel noted that the re-evaluated glyphosate results were still significant using two statistical tests recommended in the IARC Preamble. This is certainly not the first study to link glyphosate to cancer, as the IARC report indicates. A study published in 2012 by French scientists in the journal Food and Chemical Toxicology showed a link between GMO corn (heavy in glyphosate) fed to rats with liver and kidney disease and mammary tumours. The biotech industry launched an attack against the French researchers causing the journal to retract the study, but it has since been republished. Depth of Glyphosate Pollution Currently in the U.S.
Glyphosate is used so heavily in the U.S. that it has been found in human breast milk, feeding tube liquids given to babies and children with cancer in hospitals, and 75% of the air and rain samples tested in the Mississippi delta region. In 2014, Tropical Traditions tested some of the USDA certified organic products they were selling, and found glyphosate residue in organic food as well. They have now begun testing all of their products for the presence of glyphosate. Besides links between glyphosate and cancer, glyphosate has been linked to autism (see: MIT Researcher: Glyphosate Herbicide will Cause Half of All Children to Have Autism by 2025), gluten intolerance and allergies, destroying the microbiome, antibiotic resistant bacteria, kidney disease, and infertility. Can we Trust the Government to Protect us From Glyphosate Poisoning? The EPA allows for certain levels of glyphosate in U.S. foods, and they have been steadily increasing the amounts allowable. Even USDA organic standards allow a certain percentage of the EPA allowable amounts of glyphosate to be present in organic foods as residue. If the U.S. government did not allow the presence of glyphosate in U.S. food, Americans would starve, as there would not be enough food available to feed the U.S. population.